The U.S. 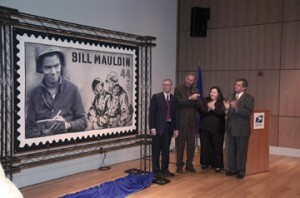 Postal Service today unveiled a 44-cent stamp honoring New Mexico native Bill Mauldin, an award-winning editorial cartoonist, and two of his most famous creations, World War II infantrymen Willie and Joe. 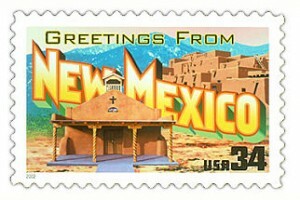 The event, at the New Mexico History Museum Auditorium, featured the New Mexico State Police Honor Guard, a rocking acapella version of the National Anthem (thank you, retired postal worker Eunita Holmes, and your family), a variety of speakers, and a stamp that just might rival the size of your average postal truck. 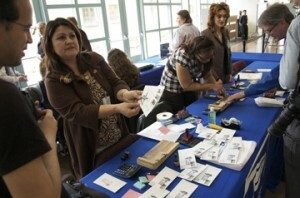 More than 150 people attended the First-Day-of-Issue Ceremony; even more lined up in the lobby to purchase stamps and commemorative materials. 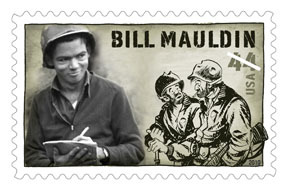 Mauldin was recalled as “an infantry man’s infantry man,” and the conscience of a nation. He won both a Purple Heart and a Pulitzer Prize for his work during World War II, which included his battle-weary Everymen, Willie and Joe. Later, Mauldin used his wry editorial humor to document the trials of the civil rights era. One of his most famous cartoons crystallized a nation’s reaction to the assassination of John F. Kennedy. In it, the statue of Abraham Lincoln holds his head in his hands, sobbing. Nearly 50,000 subjects are suggested each year for placement on a postage stamp; a maximum of 30 get chosen. (Here’s some history on Postal Service stamps and a densely dizzying timeline.) Mauldin’s legacy rose to the rare honor this year both for what he accomplished and for its symbolic tie to the importance of a hand-written letter. “In the middle of the most catastrophic war in history, there was little to cheer (the soldiers’) spirits except the long-awaited letter from home,” said Mickey Barnett, a member of the Postal Service Board of Governors. John Garcia, secretary of the state’s Veterans Services Department, asked those audience members who were veterans to stand. About a dozen did so, receiving applause that was second only to the stamp’s unveiling in its duration. A dozen of Mauldin’s children and grandchildren attended the event, and stayed along with the speakers to add their autographs to the event program for a long line of attendees. We decided to check in with the exhibit’s curator, Mary Anne Redding (that’s her, at left, in a photo by Karen Kuehn), to talk about putting it together as well as what’s next for displaying her Palace of the Governors Photo Archives fabulous collection. With more than 20 years experience as a curator, archivist, librarian, educator and arts administrator, Redding has written and published numerous essays on photography and contemporary art. Along with Krista Elrick, she co-wrote the book version of the exhibit. Her degrees are from the School of the Art Institute of Chicago; the University of Illinois, Champaign/Urbana; and Arizona State University. Pour a cup of coffee and join us for a little chat. Where did the idea of the exhibit come from and what happened when you started the search for images? The idea for Through the Lens: Creating Santa Fe started years ago. Before Dr. Frances Levine became director of the New Mexico History Museum/Palace of the Governors, she worked at the Santa Fe Community College where she was instrumental in building their Visual Arts Building. She was also teaching and team-taught a class on Visual Anthropology with the guest curator for Through the Lens, Krista Elrick. Both Fran and Krista are very community-minded and began discussions about working on a project that would involve the photographers in Santa Fe. Over the years, ideas were batted about and, when Fran became the director of the New Mexico History Museum, she brought the idea of a community project and exhibition with her. Krista was still teaching at SFCC. She was working with her students to research images of Santa Fe in our archives as well as archives across the country. When I started as the curator of photography at the Palace in March 2007, I was happy to step into the project as the lead curator from the museum as it gave me two opportunities: 1) to look in-depth at our collection of images on Santa Fe; and 2) to do studio visits with photographers with a commitment to place – to Santa Fe. The exhibition was both historical and contemporary in scope as history did not end 50 years ago or even yesterday. The Photo Archives collects images that tell the story of our past but in another 50 or 100 years, today will be past history and the archives will need to tell that story too so we actively collect work that is being down now. In the process of working on the exhibition, I came up with the title for the show after months of looking at images and thinking about the structure the show would take. We settled on three themes or “lenses” from which to look at each photo – place, identity, and history. This exhibition was not a chronologically arranged visual history of Santa Fe. Rather, these three themes intersect and overlap, showing the spherical rather than linear nature of history. What was so wonderful about working on Through the Lens: Creating Santa Fe was that, when I began working at the Photo Archives, I was relatively new to the city different and this was a great opportunity to call people up or send them an e-mail and say this is the show we are working on, can we come for a studio visit? Everybody said yes, and we were off. When people open their studios to you, they are giving you a gift of themselves – their time and their creative energies. Most especially, they are sharing their thinking about their artwork and this place – Santa Fe and what it means to be a part of the creative community here right now and how they see themselves fitting into the history of place. We did videos with about 10 of the artists in the show. You can still see those videos online. 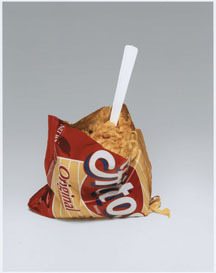 They provide a tiny glimpse into what our studio visits were like. Through the Lens took over 18 months from the time I started until the exhibition was on the walls in the Palace and an additional four months before the book came out. The entire process was full of discovery – great images and great photographers. This exhibit had one of the strongest lecture series we’ve featured. What were you aiming for in developing the topics and selecting the speakers? The 11-month lecture series was designed to bring scholars and the public together in an ongoing dialogue from museum wall to lecture hall and beyond that would add to the understanding of the rich cultural history of Santa Fe through the visual resources of the Photo Archives and through the work of contemporary image-makers committed to documenting this place. The photographic record of Santa Fe reflects the cultural diversity and traditions of northern New Mexico over the past 160+ years. The lecture series expanded the educational component of the exhibition by providing audience members not only with the opportunity to see documentary photographs in the historic Palace of the Governors but also to attend 12 free events and participate in a panel discussion and question-and-answer sessions related to the architecture, urban development, water rights, cultural diversity, tourism, and photographic history of Santa Fe. The technical and scientific aspects of early photographic processes up through the digital age were also addressed. Photographers involved in the project presented their individual philosophies about making place-based work and why it is important to understanding history both as a personal creative exploration and as a tool for future research through archival collections of visual materials. All the public programs related to Through the Lens expanded the understanding of photographs beyond the realm of the museum by articulating how images are connected to the humanities through the voices of scholars and artists knowledgeable about how history is understood visually. Photographers are an interesting entity in the communication field – intrinsically tied to the way we tell stories with words but unique in what they bring to the experience. Talk about that fraternity and the drive to document our experience through images. Photographers approach their work through various muses: some through the aesthetics of fine art, some as documentary photographers, some merely to record their family, friends, and the places in which they live, work, play and visit through snapshots and personal mementos. So many people think that anyone with a camera can be a photographer. Well, certainly anyone can push the button and take a picture but that does not mean they are a professional photographer. Many people have pianos and take lessons and play for their own enjoyment or for the pleasure of their family and friends or perhaps they belong to a band, but it takes years and years of dedicated work before they can call themselves a virtuoso in any tradition. Going to medical school doesn’t make someone a doctor: After the coursework is down, how many hours of internships and residencies are required before the doctor can make their first cut with a scalpel to remove an appendix? The Photo Archives collections work from all genres of photo history. We have work by many noted artists like Laura Gilpin and Ansel Adams, both of whom where in the exhibition. We also collect work by photojournalists like Tony O’Brien, and we also collect family snap shots which can reveal so much about family like and fashion. Many of those images you will see now in the current exhibition upstairs in the New Mexico History Museum – Fashioning New Mexico. You will also find other wonderful examples form the collection throughout the Palace and in the permanent exhibits in the New Mexico History Museum. Part of Through the Lens addressed the deliberate re-staging of Santa Fe’s image and what photographers did to accommodate that. How can people learn more about that? The two best lectures to watch to gain an understanding of how photographers were involved in creating Santa Fe’s popular image are the first lecture of the Through the Lens lecture series present by art historian and critic extraordinaire Lucy Lippard, and the last lecture in the series by author and educator Chris Wilson. We thought these talks would the ideal way to bookend the lecture series which was underwritten by a grant from the New Mexico Humanities Council. Were those photographers playing a documentary role or did they allow themselves – wittingly or not – to become accomplices in a kind of deceit? Deceit? No, I don’t think there was anything deceitful about it at the time – we tend to look back critically from a comfortable distance and bring our current thinking to re-examine what was done in the past when the answer is much more complicated. Chris Wilson’s very smart and readable book The Myth of Santa Fe: Creating A Modern Regional Tradition attempts to answer questions like yours in 418 pages with images. The essays in the book, Through the Lens: Creating Santa Fe published by the MNM Press in conjunction with the exhibition, also has answers from multiple perspectives. Read the books, both of which are available at the museum shops! What’s next for sharing the Photo Archives’ bounty? Visitors to the Palace of the Governors and the New Mexico History Museum can see hundreds of images from the collections at the Photo Archives in all the exhibits. The Book, Print, and Photo Archive shop at the Palace also has hundreds of images from our collection for sale at very reasonable prices. Another option is to go to our Web site and click on Photo Archives. There are more than 10,000 images online and new images are added every week. The Photo Archives runs a rights-and-reproductions service and many, although not all, of the images from our collections are available. The Photo Archives preserves and provides access to photographic materials of enduring historic value. The collection contains an estimated 800,000 items including original and copy prints, cased photographs, glass-plate negatives, film negatives, stereo views, postcards, panoramas, color transparencies, lantern slides, albums, framed materials, as well as a large library of books, journals, and other printed materials related to photography. The Photo Archives maintains the largest collection (excluding pot sherds) in the State of New Mexico Department of Cultural Affairs museum system. Collections of historic photographs provide a visual legacy of the past. 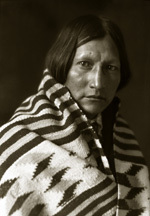 Dating from the 1860s to the present, subject matter in the Photo Archives focuses primarily on the history and people of New Mexico, the greater Southwest and the Western United States; anthropology, archaeology, and ethnology of Native American and Hispano cultures; with smaller collections documenting Europe, Latin America, the Far East, Oceana, and the Middle East. While its main emphasis is on historical subject matter, the collection is rich in the work of significant documentary and artistic photographers of the past one hundred and fifty years. The collection should never be regarded as merely a regional archive as its holdings reflect the changing cultural and social roles of photography both technically and aesthetically. The primary purpose of the Photo Archives is to collect, preserve, interpret, and disseminate the cultural history of New Mexico and the Southwest through visual records of historical and aesthetic significance. But enough about that – what about you? I love my job – every day is a visual treat – it’s great to work with so many photographs and photographers. I am working on a new exhibition, The Contemplative Landscape, that will open concurrently with St. John’s Bible on October 21, 2011. The Contemplative Landscape will feature black-and-white photographs of sacred locations or landscapes in New Mexico dedicated to ceremonial purposes, either paying tribute to an ascendant ritual authority or for the purposes of individual contemplation. Many of the images will explore the idea of a sacred community performing in landscape.